The arrival of crisp fall weather means it’s harvesttime for colorful and tasty winter squash, also known as hard squash. Some of the most popular and versatile varieties of squash include acorn, butternut, delicata, golden nugget and spaghetti. 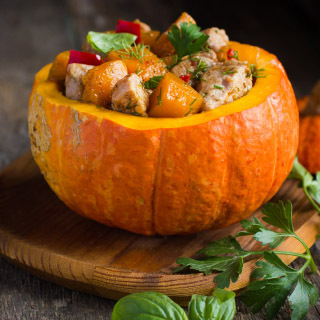 When selecting your favorite, choose squash that is heavy for its size with a smooth skin. 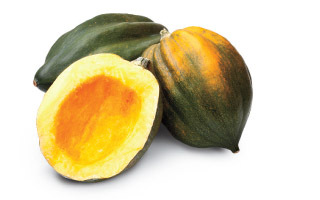 Due to its hard outer shell that protects the flesh, winter squash can be stored up to a month in a cool, dry place. These bountiful fruits work well in many dishes, from soups and salads to pastas and vegetarian entrées. 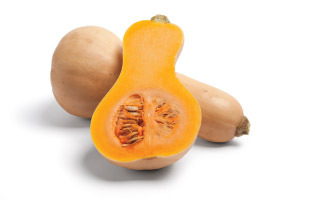 With a shape resembling an acorn, this squash has an orange-colored flesh with a delicious, mildly nutty taste. Look for acorn squash with a dull, green rind for the tenderest flesh. Acorn squash is great baked with the center scooped out and stuffed with a savory filling like rice pilaf… or try filling it with soup! A skinnier neck and bulbous bottom give this squash its signature bell shape. 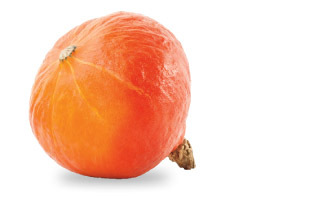 It has a light tan rind and deep orange flesh with a sweet, butterscotch-like flavor. Once cut in half and roasted, remove the skin and dice. Serve the caramelized cubes alongside meats, toss into salads or with pasta. 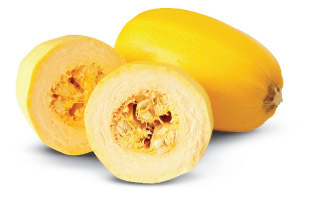 This ridged, pale yellow, earthy-tasting winter squash resembles summer squash. It’s also known as sweet potato squash since it has a similar, creamy consistency when cooked. 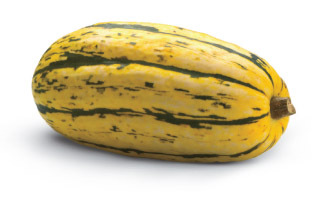 Its thin, edible skin allows this squash to be cooked more quickly than other varieties. Sliced into pretty scalloped rings or half-moons, delicata squash is great steamed, sautéed with olive oil and herbs, or simply added to simmering soups and stews. Also known as small Oriental pumpkin, this softball-sized variety of squash resembles a pumpkin. Its colorful, orange rind should have a dull finish for a sweet tasting, bright orange flesh. The squash can be roasted or steamed whole or halved, then filled with a savory quinoa and sausage stuffing before roasting. When roasted, the flesh inside this pale, oval-shaped winter squash separates into creamy, tender strands that resemble spaghetti. It’s very mild tasting, so go bold with seasonings or sauces. A lower-carb substitute any way you sauce it, use in place of rice noodles in Asian-style noodle bowls or your favorite pasta recipe. What’s the Difference between Broccoli, Broccolini and Broccoli Rabe?